This afternoon, Israeli Prime Minister Benjamin Netanyahu took to the podium at the General Assembly of the United Nations – and once again, he gave an impassioned speech outlining the history and values of the Jewish State, and explaining in perfectly basic terms what the West’s “red line” should be with regard to Iranian nuclear development. The medieval forces of radical Islam whom you just saw storming the American embassies throughout the Middle East, well, they oppose this. They seek supremacy over all Muslims. They’re bent on world conquest. They want to destroy Israel, Europe, America. They want to extinguish freedom. They want to end the modern world. He added that Palestinian leader Mahmoud Abbas’ “libelous” language about Israel did not forward the peace process. Then Netanyahu got to the meat of the matter. A nuclear-armed Iran, said Netanyahu, would be analogous to a nuclear-armed al Qaeda. “Given this record of Iranian aggression without nuclear weapons … imagine them with nuclear weapons,” he said. Diplomacy, Netanyahu noted, had failed. More than that, diplomacy had granted Iran an additional period to complete its nuclear development. Red lines don’t lead to war. Red lines prevent war. Just look at NATO’s charter. It made clear that an attack on one member country would be considered an attack on all, and NATO’s red line helped keep the peace in Europe for nearly half a century. President Kennedy set a red line during the Cuban missile crisis. That red line also prevented war and helped preserve the peace for decades. In fact, it’s the failure to place red lines that’s often invited aggression. 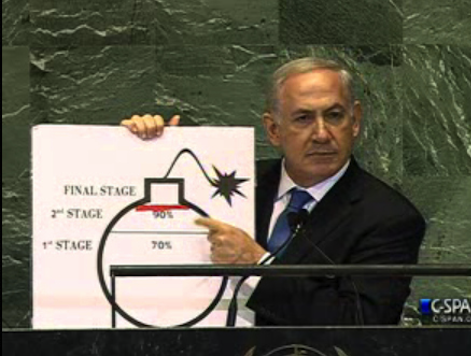 The leftist media has pounced on Bibi’s cartoon of the bomb – but the fact remains that it was a clear and understandable image for the American public. More than that, it was an unmistakable signal to the Obama administration that if they insist on acting ignorant, Netanyahu will treat them as such, as he should. Netanyahu’s muscular defense of Israel and his bravery in elucidating the basic civilizational conflict at work in the Middle East has set the table for a decision by the West. The only question now is: will Obama continue to shilly-shally on Iran, even as they draw closer to achieving their promised nuclear Holocaust? PRIME MINISTER BENJAMIN NETANYAHU: Thank you very much, Mr. President. It’s a pleasure to see the General Assembly presided by the ambassador from Israel. And it’s good to see all of you, distinguished delegates, ladies and gentlemen. Three thousand years ago King David reigned over the Jewish state in our eternal capital, Jerusalem. I say that to all those who proclaim that the Jewish state has no roots in our region and that it will soon disappear. Throughout our history, the Jewish people have overcome all the tyrants who have sought our destruction. It’s their ideologies that have been discarded by history. The people of Israel live on. We say in Hebrew, am yisrael chai. And the Jewish state will live forever. The Jewish people have lived in the land of Israel for thousands of years. Even after most of our people were exiled from it, Jews continued to live in the land of Israel throughout the ages. And the masses of our people never gave up the dream of returning to our ancient homeland. Defying the laws of history, we did just that. We gathered the exiles, restored our independence and rebuilt our national life. The Jewish people have come home. We will never be uprooted again. Yesterday was Yom Kippur, the holiest day of the Jewish year. Every year for over three millennia, we have come together on this day of reflection and atonement. We take stock of our past. We pray for our future. We remember — we remember the sorrows of our persecution. We remember the great travails of our dispersion. We mourn the extermination of a third of our people, 6 million, in the Holocaust. But at the end of Yom Kippur we celebrate. We celebrate the rebirth of Israel. We celebrate the heroism of our young men and women who’ve defended our people with the indomitable courage of Joshua, David and the Maccabees of old. We celebrate the marvel of the flourishing modern Jewish state. You see, in Israel we walk the same paths tread by our patriarchs, Abraham, Isaac and Jacob, but we blaze new trails in science, technology, medicine, agriculture. In Israel the past and the future find common ground. Well, unfortunately that’s not the case in many other countries, for today a great battle is being waged between the modern and the medieval. The forces of modernity seek a bright future in which the rights of all are protected, in which an ever-expanding digital library is available in the palm of every child, in which every life is sacred. The forces of medievalism seek a world in which women and minorities are subjugated, in which knowledge is suppressed and in which not life but death is glorified. These forces clash around the globe, but nowhere more starkly than in the Middle East. We protect the rights of all our citizens, men and women, Jews and Arabs, Muslims and Christians. All are equal before the law. Israel is also making the world a better place. Our scientists win Nobel Prizes. Our know-how is in every cellphone and computer that you’re using. We prevent hunger by irrigating arid lands in Africa and Asia. Recently I was deeply moved when I visited Technion, one of our technological institutes in Haifa, and I saw a man paralyzed from the waist down climb up a flight of stairs fairly easily with the aid of an Israeli invention. And Israel’s exceptional creativity is matched by our people’s remarkable compassion. When disaster strikes anywhere in the world, in Haiti, Japan, India, Turkey, Indonesia and elsewhere, Israeli doctors among — are among the first on the scene performing lifesaving surgeries. In the past year I lost both my father and my father-in-law. In the same hospital wards where they were treated, Israeli doctors were treating Palestinian Arabs. In fact, every year thousands — thousands of Arabs from the Palestinian territories and Arabs from throughout the Middle East come to be — to Israel to be treated in Israeli hospitals by Israeli doctors. I know you’re not going to hear that from speeches around this podium, but that’s the truth. It’s important that you are aware of this truth. And it’s because Israel cherishes life that Israel cherishes peace and seeks peace. We seek to preserve our historic ties and our historic peace treaties with Egypt and Jordan. We seek to forge a durable peace with the Palestinians. President Abbas just spoke here. I say to him, and I — and I say to you, we won’t solve our conflict with libelous speeches at the U.N. That’s not the way to solve it. We won’t solve our conflict with unilateral declarations of statehood. We have to sit together, negotiate together and reach a mutual compromise in which a demilitarized Palestinian state recognizes the one and only Jewish state. We’ve seen that happen before. Some 500 years ago the printing press helped pry a cloistered Europe out of a dark age, and eventually ignorance gave way to enlightenment. So too a cloistered Middle East will eventually yield to the irresistible power of freedom and technology. And when this happens, our region will be guided not by fanaticism and conspiracy but by reason and curiosity. I think the relevant question is this: It’s not whether this fanaticism will be defeated, it’s how many lives will be lost before it’s defeated. And we’ve seen that happen before too. Some 70 years ago the world saw another fanatic ideology bent on world conquest. Now, it went down in flames, but not before it took millions of people with it. Those who opposed that fanaticism waited too long to act. In the end, they triumphed, but at an horrific cost. My friends, we cannot let that happen again. You see, at stake is not merely the future of my country. At stake is the future of the world. And nothing could imperil our common future more than the arming of Iran with nuclear weapons. To understand what the world would be like with a nuclear-armed Iran, just imagine the world with a nuclear-armed al-Qaida. Now, it makes little difference whether these lethal weapons are in the hands of the world’s most dangerous terrorist regime or the world’s most dangerous terrorist organization. They’re both fired by the same hatred. They’re both driven by the same lust for violence. Just look at what the Iranian regime has done up till now, without nuclear weapons. In 2009 they brutally put down the protests — mass protests for democracy in their own country. Today their henchmen are participating in the slaughter of tens of thousands of Syrian civilians, including thousands of children, directly participating in this murder. They abetted the killing of American soldiers in Iraq and continue to do so in Afghanistan. And before that, Iranian proxies killed hundreds of American troops in Beirut and in Saudi Arabia. They’ve turned Lebanon and Gaza into terrorist strongholds, embedding nearly a hundred thousand missiles and rockets in civilian areas. Thousands of these rockets and missiles have already been fired at Israeli communities by their terrorist proxies. In the last year they’ve spread their international terror networks to two dozen countries across five continents, from India and Thailand to Kenya and Bulgaria. They’ve even plotted to blow up a restaurant a few blocks from the White House in order to kill a diplomat. And of course, Iran’s rulers repeatedly deny the Holocaust and call for Israel’s destruction almost on a daily basis, as they did again this week from the General — from the United Nations. So I ask you, given this record of Iranian aggression without nuclear weapons, just imagine Iranian aggression with nuclear weapons. Imagine their long-range missiles tipped with nuclear warheads, their terror networks armed with atomic bombs. Who among you would feel safe in the Middle East? Who’d be safe in Europe? Who’d be safe in America? Who’d be safe anywhere? Now, there are those who believe that a nuclear-armed Iran can be deterred like the Soviet Union. That’s a very dangerous assumption. Militant jihadists are not secular — militant jihadists behave very differently from secular Marxists. There were no Soviet suicide bombers, yet Iran produces hordes of them. Deterrence worked with the Soviets because every time the Soviets faced a choice between their ideology and their survival, they chose their survival. But deterrence may not work with the Iranians once they get nuclear weapons. There’s a great scholar of the Middle East, Professor Bernard Lewis, who put it best. He said that for the ayatollahs of Iran, mutually assured destruction is not a deterrent, it’s an inducement. Iran’s apocalyptic leaders believe that a medieval holy man will reappear in the wake of a devastating holy war, thereby ensuring that their brand of radical Islam will rule the earth. Now that’s not just what they believe. That’s what is actually guiding their policies and their actions. Just listen to Ayatollah Rafsanjani, who said — I quote — “The use of even one nuclear bomb inside Israel will destroy everything. However, it would only harm the Islamic world.” Rafsanjani said, “It is not irrational to contemplate such an eventuality” — not irrational. And that’s coming from one of the so-called moderates of Iran. Shockingly, some people have begun to peddle the absurd notion that a nuclear-armed Iran would actually stabilize the Middle East. Yeah, right. That’s like saying a nuclear-armed al-Qaida would usher in an era of universal peace. Ladies and gentlemen, I’ve been speaking about the need to prevent Iran from developing nuclear weapons for over 15 years. I spoke about it in my first term in office as prime minister, and then I spoke about it when I left office. I spoke about it when it was fashionable and I spoke about it when it wasn’t fashionable. I speak about it now because the hour is getting late, very late. I speak it about it now because the Iranian nuclear calendar doesn’t take time out for anyone or for anything. I speak about it now because when it comes to the survival of my country, it’s not only my right to speak, it’s my duty to speak. And I believe that this is the duty of every responsible leader who wants to preserve world peace. For nearly a decade the international community has tried to stop the Iranian nuclear program with diplomacy. Well, that hasn’t worked. Iran uses diplomatic negotiations as a means to buy time to advance its nuclear program. For over seven years — for over seven years the international community has tried sanctions with Iran. Under the leadership of President Obama, the international community has passed some of the strongest sanctions to date. I want to thank the governments represented here that have joined in this effort. It’s had an effect. Oil exports have been curbed, and the Iranian economy has been hit hard. It’s had an effect on the economy, but we must face the truth; sanctions have not stopped Iran’s nuclear program either. According to the International Atomic Energy Agency, during the last year alone, Iran has doubled the number of centrifuges in its underground nuclear facility in Qom. So at this late hour, there’s only one way to peacefully prevent Iran from getting atomic bombs, and that’s by placing a clear red line on Iran’s nuclear weapons program. In fact, it’s the failure to place red lines that’s often invited aggression. If the Western powers had drawn clear red lines during the 1930s, I believe they would have stopped Nazi aggression, and World War II might have been avoided. In 1990, if Saddam Hussein had been clearly told that his conquest of Kuwait would cross a red line, the first Gulf War might have been avoided. Clear red lines have also worked with Iran. Earlier this year, Iran threatened to close the Straits of Hormuz. The United States drew a clear red line, and Iran backed off. Now, red lines could be drawn in different part of Iran’s nuclear weapons program, but to be credible, a red line must be drawn first and foremost in one vital part of their program, on Iran’s efforts to enrich uranium. Now, let me explain why. Basically, any bomb consists of explosive material and a mechanism to ignite it. The simplest example is gunpowder and a fuse. That is, you light the fuse and you set off the gunpowder. In the case of Iran’s plans to build a nuclear weapon, the gunpowder is enriched uranium; the fuse is a nuclear detonator. For Iran, amassing enough enriched uranium is far more difficult than producing the nuclear fuse. For a country like Iran, it takes many, many years to enrich uranium for a bomb. That requires thousands of centrifuges spinning in tandem in big — very big industrial plants. Those uranium plants are visible, and they’re still vulnerable. In contrast, Iran could produce the nuclear detonator, the fuse, in a lot less time, maybe under a year, maybe only a few months. The detonator can be made in a small workshop the size of a classroom. It may be very difficult to find and target that workshop, especially in Iran. That’s a country that’s bigger than France, Germany, Italy and Britain combined. The same is true for the small facility in which they could assemble a warhead or a nuclear device that could be placed in a container ship. Chances are you won’t find that facility either. So in fact the only way that you can credibly prevent Iran from developing a nuclear weapon is to prevent Iran from amassing enough enriched uranium for a bomb. So how much enriched uranium do you need for a bomb, and how close is Iran to getting it? Well, let me show you. Brought a diagram for you. Here’s a diagram. This is a bomb. This is a fuse. In the case of Iran’s nuclear plans to build a bomb, this bomb has to be filled with enough enriched uranium. And Iran has to go through three stages. The first stage, they have to enrich enough low-enriched uranium. The second stage, they have to enrich enough medium-enriched uranium. And the third stage and final stage, they have to enrich enough high-enriched uranium for the first bomb. Where’s Iran? Iran’s completed the first stage. Took them many years, but they completed it, and they’re 70 percent of the way there. Now they’re well into the second stage. And by next spring, at most by next summer at current enrichment rates, they will have finished the medium enrichment and move on to the final stage. From there, it’s only a few months, possibly a few weeks before they get enough enriched uranium for the first bomb. Ladies and gentlemen, what I’ve told you now is not based on secret information. It’s not based on military intelligence. It’s based on the public reports of the International Atomic Energy Agency. Anybody can read them. They’re online. So if these are the facts — if these are the facts — and they are — where should a red line be drawn? A red line should be drawn right here — before — before Iran completes the second stage of nuclear enrichment necessary to make a bomb, before Iran gets to a point where it’s a few months away or a few weeks away from amassing enough enriched uranium to make a nuclear weapon. Now, each day that point is getting closer. And that’s why I speak today with such a sense of urgency, and that’s why everyone should have a sense of urgency. Now, there are some who claim that even if Iran completes the enrichment process, even if it crosses that red line that I just drew, our intelligence agencies will know when and where Iran will make the fuse, assemble the bomb and prepare the warhead. Look, no one appreciates our intelligence agencies more than the prime minister of Israel. All these leading intelligence agencies are superb, including ours. They’ve foiled many attacks. They’ve saved many lives. But they are not foolproof. For over two years our intelligence agencies didn’t know that Iran was building a huge nuclear enrichment plant under a mountain. Do we want to risk the security of the world on the assumption that we would find in time a small workshop in a country half the size of Europe? Ladies and gentlemen, the relevant question is not when Iran will get the bomb. The relevant question is at what stage can we no longer stop Iran from getting the bomb. The red line must be drawn on Iran’s nuclear enrichment program because these enrichment facilities are the only nuclear installations that we can definitely see and credibly target. And I believe that, faced with a clear red line, Iran will back down. And this will give more time for sanctions and diplomacy to convince Iran to dismantle its nuclear weapons program altogether. Two days ago from this podium, President Obama reiterated that the threat of a nuclear-armed Iran cannot be contained. I very much appreciate the president’s position, as does everyone in my country. We share the goal of stopping Iran’s nuclear weapons program. This goal unites the people of Israel. It unites Americans, Democrats and Republicans alike. And it is shared by important leaders throughout the world. What I have said today will help ensure that this common goal is achieved. Israel is in discussions with the United States over this issue, and I am confident that we can chart a path forward together. Ladies and gentlemen, the clash between modernity and medievalism need not be a clash between progress and tradition. The traditions of the Jewish people go back thousands of years. They are the source of our collective values, the foundations of our national strength. At the same time, the Jewish people have always looked towards the future. Throughout history, we’ve been at the forefront of efforts to expand liberty, promote equality and advance human rights. We champion these principles not despite of our traditions but because of them. We heed the words of the Jewish prophets Isaiah, Amos and Jeremiah to treat all with dignity and compassion, to pursue justice and cherish life and to pray and strive for peace. These are the timeless values of my people, and these are the Jewish people’s greatest gift to mankind. Let us commit ourselves today to defend these values so that we can defend our freedoms and protect our common civilization.